How nice to see you posting, Renee. Welcome to the group! But... since Kathy's problem started prior to yesterday's post, it must have been a lot of beans the night before yesterday! Wendy for the beautiful Cosmos. Morning all,bright pink flowers to start the day, thanks Wendy. Kathy, hope they find the leak today. Oh, they are trying, Amelia. I have put a few photos on my page if you'd like proof. Kathy, I certainly hope the workmen find the true source of the gas leak. The alternative discovery method is not very smart. Got back home just in time. Guess I've been missing all the fun - happy to know no crises occurred re. the elusive gas leak, Kathy. Hope everyone is enjoying this day - share your joy! My grandmother always had cosmos growing along her fence. These seem much shorter. Hers bobbed at the top of the fence. She had a double lot on a corner, so there was a lot of fence and a lot of cosmos. Yesterday's discussion about the bird was fascinating, so MRS. Wombat and I did some research. There were two indications of what it could be, where the picture was taken and how the bird looked. Since it was taken in Western Australia neither Chickadee or Phoebe seem likely as they are not found in Australia, let alone Western Australia. While there is some resemblance between some of the chickadees and this bird there is too much white on the head. Similarly the eastern phoebe has too much white on the underbody and no white marks on the head, so this supports the view that it is neither of these birds. 2:17 Didn't get much sleep last night. 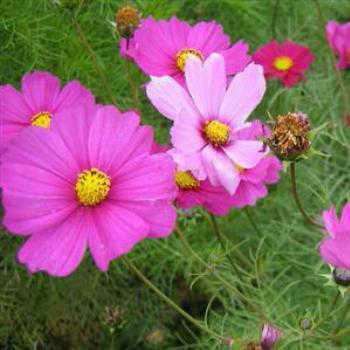 Your description of your grandmother's cosmos-lined corner lot of those tall variety reminds me of what we always have too, Sarah, in their many colors - crimson, purple, white, pink rose, lavender! Sarah, do you recall a specific date(s) when these puzzles occurred. I vaguely remember doing them, but I don't want to spend a lot of time searching for them. Thanks. Beer time. Fortunately, I just opened one. Your memories also presented the picturesque landscapes we often see when visiting our daughters in North Carolina where the transportation department plants the medians full of perennials and wildflowers... poppies, sunflowers, larkspur and, as I recall the ones in the Triad area are mainly filled with large swaths of cosmos! all. I'm off to bed shortly, after a long day of baking & wrapping gifts. Because we leave for the sunny south in 2 weeks, I have to have all my Christmas gifts wrapped and the baking done for us & for both daughters. It's all done & I am pooped! I have made 7 dozen mincemeat tarts with homemade mincemeat, 2 boiled cakes, 3 batches of shortbread, a batch of cinnamon buns and one batch of cheddar crisp biscuits. Phew! I'm tired just thinking about all that baking. We'll take some of it south with us. How far south are you going, Snowbird? It's 49F (9C) degrees here now. Not very warm. But first... Ah, forget it. Let someone else have the fun.